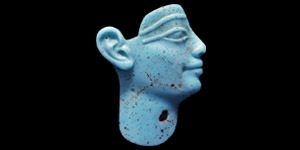 A turquoise glass inlay of a profile head with raised eyebrow and eye-line, neat facial detailing with curved slot beside the ear; mounted on a custom-made stand. 79 grams total, 40mm (1 1/2"). Very fine condition. Rare. From a UK collection; previously sold Bonhams, London, 15th October 2008, lot 29 (£8,000); formerly acquired in Germany in the 1960s; accompanied by a copy of the relevant Bonhams catalogue pages. Cf. Goldstein, S., Pre-Roman and Early Roman Glass in the Corning museum of Glass, New York, 1979, pp.242-243, no.702.